Is it time for a new Colloid Master or a gift of backup unit? Here is a $20 off of all Colloid Master Colloidal Silver Generators use it or give it to a friend. After 20 years and counting of providing technical and customer support for the Colloid Master, we know within a few minutes of talking to a customer what the issue is. Based on these years of experience, we have compiled this troubleshooting section that will help you right now. That said, feel free to call us if you are having a problem, we have the best customers on the planet and enjoy talking to you. The following is usually what we go over during any technical support call. The two most common problems that people experience are; (1) the green light won’t stay on and (2) The process seems to be running too long or won’t shut off by itself. When either of these things occur, the typical response is to wonder if there is a problem with the Colloid Master. After you follow the tests below, you will see for yourself that by following the procedures below, any issues are determined and that dysfunctional Colloid Masters are rare to none. The first thing we want to do is to assure you that we will take care of you and make sure you are happy with your Colloid Master. Because we are the manufacturer we can and will fix the problem if there is a problem. We also service the Colloid Master when it is out of warranty. That said, the number one issue is water quality, although you should follow the troubleshooting steps 1 – 4 which will allow you to test all functions of the Colloid Master and assist you in correcting issues that can cause problems. All of this is covered if you keep reading and follow the simple steps explained below. Check the specs on your power supply, the wall transformer that you plug into the outlet on the wall. Does the label say Output: 12 volts at 500 mA? if not you may not be using the original power supply, Call us if you need to replace a lost or broken power transformer. Plug in your power supply, if it is the correct specs, as shown in item 1. above, then connect the coaxial adapter from it into the Colloid Master.Turn the ppm dial to 16 PPM, take the electrode wires from the back of the Colloid Master and separate them so that they do not touch and set them on a nonmetallic surface. Start the Colloid Master all by itself as just described, not connected to the silver electrodes. Press the start/process button, if the green LED light (indicator) is on and stays on the Colloid Master is working correctly, and you can proceed to the next section to do the water quality shut-off test here. If the Colloid Master does not power-up, or the green light does not stay on when you start the Colloid Master by itself (not connected to the silver in water) then call us, because you most likely need a new wall transformer/power supply. (423) 261-2492 . Since the Colloid Master was designed to monitor and respond to PPM, it can also be used to verify water quality. It is important to note that: the Colloid Master is only designed to work with pure distilled water, not tap or spring water. The water quality test is related to the fact we have built the Colloid Master to have an automatic shut off feature. This test involves two steps. Fill your jar with water but not so full that it will spill if moved. Suspend the electrodes into the water using the electrode holder which keeps the electrodes 1 1/4 inches apart. You may also hang the electrodes from the rim of the jar but the distance that the electrodes are apart should not exceed 2 1/2″ inches. If a custom electrode holder is used the electrodes should be set at 1 /1/4″ inches apart and no closer than 3/4″ of an inch apart. The flat side of the electrodes should face each other. Plug the wall power supply into the Colloid Master, turn the PPM adjuster dial to the highest setting (setting 16 PPM), press the green start button. If the green light does not stay on the water has more than 16 ppm of something in it and is not usable. If the green light stays on, then very slowly turn the dial down toward the lowest numbered setting and observe where the green light goes out. If the green light does not go off at all, and instead remains on, this is very good and means the water is very pure. If the green processing light does not go off at any setting, it means the water has less than 1 PPM of dissolved solids in it and is pure. If the green light goes out somewhere around setting #1 PPM (bottom of the dial) the water is acceptable, if the green light goes out at or above setting 3 PPM (just below the 4 PPM indicator), the water is not generally considered pure enough, and a better quality water should be gotten or the distilled water you are using may need post-filtering. Also see the section titled “Dealing with water quality issues“. For this test to work correctly, you must first validate the water quality test as described above in (Step 1), then proceed to this step. First depress the spring loaded tab that connects the electrode wires to the back of the Colloid Master and remove each wire. Then press the spring loaded tabs again and reinsert the electrode wires into the back of the Colloid Master, visually inspecting to make sure that only the metal wire not the plastic shielding makes contact with the visible metal part of the connector on the back of the Colloid Master. With your jar of water and the electrodes still ready from having done (Step 1) above, now connect the electrode wires from the Colloid Master to the silver electrodes in the water. 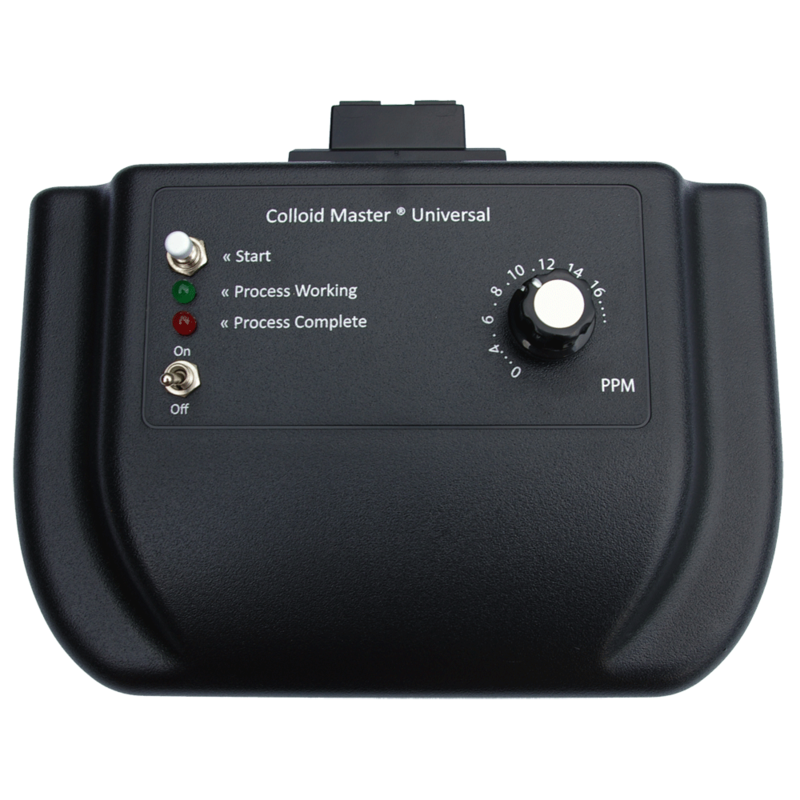 Turn the PPM adjustment dial on the Colloid Master to setting 16 PPM, then press the start process button. The green processing light should stay on, if it doesn’t stay on proceed to the section below titled: “The green light won’t stay on unless the start button is held in”. If the green processing light stays on at setting # 16 PPM, then the most direct way to test if the automatic shut off feature is working is to now move the silver electrodes to an angle that causes them to touch IN THE WATER so that the energy goes into the water, not the Colloid Master. If the green processing light on the Colloid Master shuts off when the electrodes are touched together in the water it is working correctly. It is not a feature that partially works, if it works it works correctly, if it becomes dysfunctional it will not work at all. As mentioned in all Colloid Master literature, the process is designed only to work with distilled water. The Colloid Master was designed to make reliably a consistent ppm each time. But that is not the only reason we developed the automatic shut off feature, we wanted to ensure that the process would not work if contaminants were present in the water. The most widely available water to use that meets this criterion distilled water. Note: If you have access you may use deionized water, or pass your distilled water through deionization media to prepare the water for processing, although it is not a requirement. The easiest solution generally speaking is to purchase a different brand of distilled water. The second solution is to post-filter the distilled water. This is usually only needed if you are distilling your own water, and the reasons for this may include that; the stainless that was used to make your distiller may be leaching its metal into the final distilled water. Also, If you are distilling your own water the coconut-charcoal final filter may not be working adequately, or may need replacement. The best quality to use is deionized reagent standard distilled water, but we get very good results using simple readily available methods to post-filter and increase water purity. One of the easiest and most inexpensive ways to post filter or clean-up distilled water is with a Zerowater ® pitcher filter. Their product literature claims 99.9% removal of contaminants. Most people have reported excellent results using that system. Optionally, you can also confirm water quality with a portable water tester that digitally displays the total dissolved solids, or lack of them. We sell the TDS-EZ here. If you started here and have not yet done steps 1-4 you should do so now. As described in the water test above, the Colloid Master knows if the water is pure or not. Turn the dial to the highest setting, press the start button, if the green light goes on while the button is depressed, but it then the light goes off when you take your finger off of the start button, the following describes what you should do. This may indicate such things as highly contaminated water containing things like VOCs (Volatile Organic Compounds). However, this symptom can also be one of the only indicators of a dysfunctional Colloid Master. How to determine if the problem is the Colloid Master or a water quality issue. Plug in the wall transformer and plug it into the Colloid Master. Press the spring loaded tabs on the back of the Colloid Master and completely removed the electrode wires. Set the Colloid Master to 16 PPM, plug the power supply into the Colloid Master and press start. If the green light stays on by itself, the Colloid Master is ok. If the green light only stays on with the start button pressed in the Colloid Master has possibly been affected by an intense power line surge or lightning strike to the power line are among the main reasons that the Colloid Master behaves like this. In this case, you should call or email us and arrange to send the power supply along with the Colloid Master to us for repair. To avoid problems with the Colloid Master, you should only plug your power supply into a surge-protector or better yet a surge protector lightning arrestor. If your Colloid Master green light stays on after pressing the start button and stays on without holding the start button, then nearly 100% of the time it is a water quality issue. See the sections titled “Using the Colloid Master built in water quality test function” and “Dealing with water quality issues“. The power supply is bad. The Colloid Master is dysfunctional. When the Colloid Maser does not power up, 99.9% of the time it is due to a faulty or simply from trying to use an incorrect power supply altogether. The Colloid Master is designed, constructed and so well built that we almost never have a problem with them, ever. However; if you have the correct power supply and the Colloid Master does not power up, and then we ask that you call or email us to arrange to send both the power supply and Colloid Master to us for our tech dept to review your equipment. If you are in an international location, due to shipping costs involved, it is usually a safe bet that the fix 99.9% of the time is just to order a replacement power supply from us rather than sending the whole unit to us. However, if you have completed the steps in the section above titled The green light won’t stay on unless the start button is depressed, and the green led on the Colloid Master did not stay on with the wires NOT connected to the silver in water. Then you will need to send the Colloid Master to us for repair. If you are having a problem, you can call us at (423) 261-2492 or email us now here. The most common reason that the process runs longer than usual is from having the electrodes too far apart. You can avoid this problem by reading the section on Making standard batches or Making larger batches below. The other main reason that batches can run longer or not shut off, as usual, may be surprising at first glance, and some people will doubt the veracity of this instruction until their experience proves that it is true that; solar flare energy/radiation that reaches Earth, can affect the colloidal production process. This issue is covered below in the section titled: “Solar events and environmental influences that affect the process”. The Colloid Master only cares about making small particles and only shuts off at the right ppm, the main thing that changes is the time it takes to make a batch. If you make a batch that is larger than 32 ounces, the electrode distance as well as the electrode size you are using effects the time it takes to make a batch, but the ppm and particles, in general, will still be consistent. Generally speaking, you get the best results when making a 32-ounce batch, and using an electrode holder to keep the electrodes at 1 1/4″ inches apart. A 32 ounce batch with water that tests 1 ppm or less before beginning the process, using electrodes that a 6″ inch X 1/2″ or 1/4″ inch .999 silver will average approximately 3.5 to 6 hours. If you are using a custom electrode holder, the optimal electrode distance is 1 1/4″ inches to no closer than 3/4″ of an inch apart. If the electrodes are curved outward in the water, this can cause the unit to take longer to shut off. Production time and parts per million, in general, will change primarily due to factors such as water quality, power source, having the jar too close to 220 Volt AC power lines or anything that creates moving magnetic fields such as a 220 Volt AC motors. Surprisingly one of the biggest concerns is the Sun, in particular, solar events such as coronal mass ejections. At first, this may seem odd, however; we have monitored numerous solar events that correlate to observed changes in the colloidal production time and resulting colloid for more than 13 years at the time of this writing. This issue is covered below in the section titled: “Is it true Solar coronal ejections effect making colloids here on Earth?”. It is always best to use an electrode holder and keep the electrodes about 1 1/4″ inches apart. Our rule of thumb is to use 32-ounce jar and an electrode distance of 1 1/4″ inches to no closer than 3/4″ of an inch and no further apart than 2 1/2 inches. Whenever a batch runs longer than usual for 2 hours or more, we call that batch done and shut it off. The only time this will ever occur is when energy from solar flares is saturating Earth. Also, see Solar flares and environmental influences below. The general range of time it takes to produce colloid is dependant upon; the setting used, the total volume of water, electrode distance, electrode size and environmental conditions. The average time expected for setting 10 PPM using .999 silver electrodes that ar 6″ inches long by 1/2″ or 1/4″ inch, making a 32-ounce batch, takes approximately 3.5 to 6 hours, if the water tests 1 ppm or less. Increasing the electrode distance increasing the time to make a batch by several hours, and increasing volume such as making a gallon can increase the time from 8 to 24 hours per batch. The water quality, environmental and other variables such as how large is the volume of water used for the batch, the electrode distance and electrode size will cause variations in a manner that primarily affect the time to complete the process. You will become familiar after making several batches, and with experience you will familiarize yourself with the subtleties of the process. Most people become creative and make the process their own in their unique ways. The time required to produce a batch of colloid at the same setting may vary slightly from one batch to the next, even when using the same water. We believe the cause if this is the subtle influence of fluctuations caused by cosmic radiation that reaches Earth, as well as atmospheric interplays with such energies and the magnetic field of the Earth itself, and when conditions are sufficient to effect the production process, they do. The good news is that even with constantly changing influences that collectively have an impact on the process, the resulting colloid is very predictable overall. A consistently small particle size is maintained by the Colloid Master from batch to batch. As a result, the colloid is stable batch to batch, and the PPM is very repeatable. We have colloid in storage from over a ten years ago that has remained about the same PPM as when first stored, meaning within approximately 1 PPM of what it was originally when stored. As a note, the stored colloid we have ranges from 10 to 17 PPM. Note: Batch size should not exceed 1 gallon. If you make a batch larger than 32 ounces, do not exceed 128 ounces (1 gallon). If you are making one-gallon batches, the time it takes to complete the batch can range from 5 hours to more than 24-hours, depending on water quality and electrode size and distance it can be sooner than 5 hours but it should not take longer than 24 hours. If a gallon batch runs more than 24 hours, see the section on solar and environmental influences. Also, the addition of a few ounces of previously made colloid as a starter can speed the process up. Regarding the Colloid Master stability, it functions the same way every time, however; there are other factors to consider. Changes in environmental conditions have an effect on the process such as ionization in the air that transfers to the container during the process, as well as forms of cosmic energy from space and energy from solar events that reach Earth. That is why we do not use a timer, we have found that, to maintain small particles a precise adaptive process is required, realizing this is what lead to the creation of Colloid Master auto-shut off configuration. During the process there is water and silver interacting with electrical current, silver atoms and ions are dispersed into the water, some silver combines directly with oxygen (silver oxide) on the electrodes. The silver oxide produced during the process will not become suspended in the liquid, because the material accumulated on the electrodes aggregates into a much larger particle size, larger than one micron and particles of this type and size will not remain in suspension, and instead they precipitate onto the bottom of the container. At times of intense solar events, the silver oxide particles accumulate and fall off of the electrodes to become readily visible on the bottom of the production container. At these times, there will also be a noticeable accumulation of the dark colored silver oxide on the electrodes, more so than usual. Solar events usually have an effect on the colloidal silver production process here on Earth for no more than three days, as a general rule of thumb. Solar events have a strong influence regarding slowing the process of making a colloid, primarily because it causes increased oxidation, which inhibits silver from moving into the water and if it accumulates too much it inhibits the auto shut off sensing. The effects from solar events usually last about three days, which occurs especially when the sun produces a coronal mass ejection, and if the trajection is aimed our way the sun sends lots of high energy phenomena such as x-rays, gamma, etc. our way. The finished colloid should be filtered to remove the silver oxide material that falls to the bottom; a simple nonbleached coffee filter is often adequate. The colloid can be filtered and used or stored immediately after the process completes. Although you can use the finished batch immediately, it is usually best to wait for 36 to 72 hours as mentioned above, when the particles have finished dispersion and reached the stable phase. The approach that you take to filter the final product needs should be carefully considered, concerning the intended purpose. If you use any filter media made from plastics, it can adversely effect on the ions in the solution and can even cause the colloidal particle clusters to aggregate. The easiest method we have found is to use three non-bleached coffee filters in a funnel gravity filter system. A better approach is to use paper filter media and a vacuum filter. That said, we have found if you use paper filter media, it is best if that paper is not chemically treated (as is the case with white bleached coffee filters), as that may negatively affect the colloid. It is best to use paper that is non-bleached and does not contain antimicrobial or other chemicals. Such things as formaldehyde possibly used during the paper production process of bleached paper very undesirable. We are not a lab supply and because of the complexities involved we do not sell filter media or systems. A search for the term lab supply provides plenty of options. For most of our work, we use 3-4 brown paper coffee filters and a gravity or vacuum filter method with appropriately sized paper filter discs. The usual reason that a batch will shut off sooner than expected is because the distilled water is not pure enough (also see the section titled “Using the Colloid Master built in water quality test function”. However, we need to qualify what is meant by sooner. If a batch runs less than 45 minutes with less than pure water, that is normal. With very pure distilled water, the process runs approximately 1.5 hours with a 1 1/4″ inch electrodes spacing and about 3-6 hours with a 2 1/2″ inch electrode spacing, as averages for a 32-ounce batch. The next most common reason that a batch shuts off sooner than normal is when the electrodes are closer than 1″ inch, which can cause the process can turn off faster. The electrodes should not be closer than approximately 1 1/4″ inch to 1″ inch apart, unless the batch is larger than 32 ounces. The Colloid Master only cares about making small particles and only shuts off at the right ppm, the main thing that changes is the time it takes to make a batch. If you make a bigger than 32-ounce batch that changes the time, the electrode distance as well as the electrode size you are using effects the time it takes to make a batch, but the ppm and particles will still be consistent. Generally speaking, you get the best results when making a 32-ounce batch, and using our electrode holder to keep the electrodes1 1/4″ inches apart. 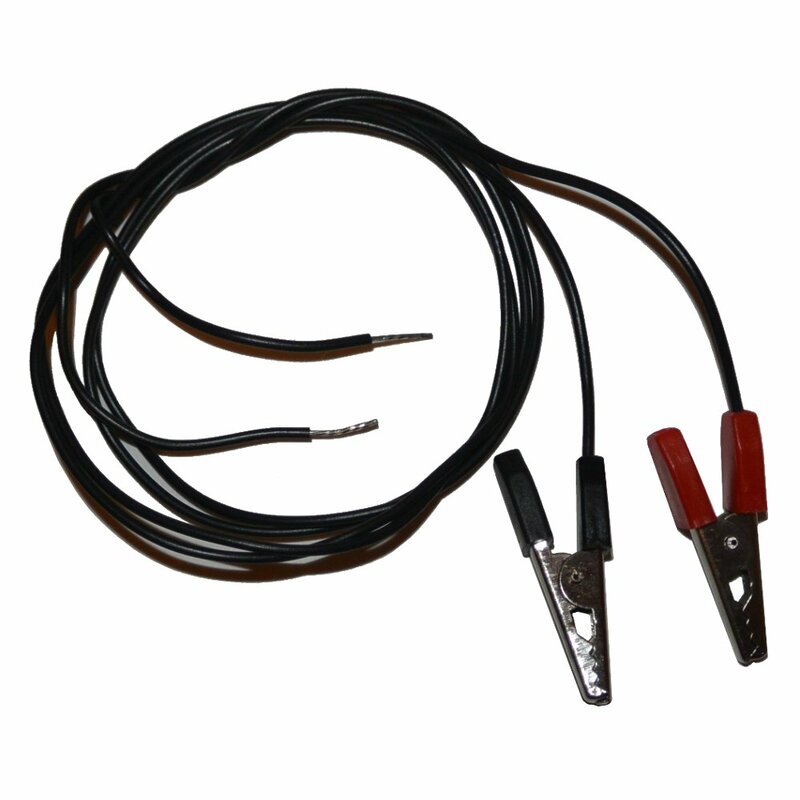 If you are using a custom electrode holder, the optimal electrode distance is 1 1/4″ inches to 1 3/4″ of an inch apart. If the electrodes are curved inward toward each other in the water and are too close, this can cause the unit to shut off sooner. If you have reviewed this material and still have questions or concerns feel free to call or email us. We do not use salt or bicarbonate of soda as a part of the colloidal production. There are or have been proponents of the utilization of those materials, which is used to increase conductivity in the water. Usually, this is done to compensate for the inadequacies of the overall control of the process, and speed the process up. However, taking this approach causes variations in the process and the resulting colloid dispersion that our opinion is undesirable, such as creating particle clusters that are too large, which causes the finished product unstable or otherwise degraded. If one wishes to speed the process using the Colloid Master the only method that will work is the addition of 1 to 3 ounces of previously made colloid to the fresh distilled water before starting a new batch. After the water test is complete or when using water of known adequate quality, you may add a few ounces of colloidal silver you have made to a new batch as a starter, this will decrease the time needed for the process to complete. Using already made colloid as a starter is the optimal method. The use of a 1 -3 ounces of already made colloid as a starter may decrease the time that the process takes to complete, but it does not increase PPM or otherwise measurably alter the end results from the usual outcome. Heating the water is not required with the Colloid Master, it is designed to work at room temperature meaning an Environment: 60 to 105 F (15.5 – 40.5 Celsius). Some users indicate that they are using a heating device to maintain a water temperature that varies from user to user but is below boiling, and they prefer this approach. The bonds in the water are more malleable at warmer temperatures, and there may be a benefit in taking this approach for you. Again, as always, the Colloid Master is a very flexible device regarding how people use it. You are responsible for validating the resulting colloidal dispersion to see if the results are what you yourself need for your specific purpose. What happens when the Colloid Master process is complete? The Colloid Master shuts off automatically. At that point, the electrodes can be removed. The water (dispersion medium) combined with the silver particles will go through a dispersion-phase during the first 36-72 hours. During this time, the particles create stable associations forming nanoclusters. After the first 36-72 hours the particles are in a stable phase or state, relatively speaking. It is of particular importance to keep the colloid out of direct sunlight during the first 36-72 hours. The finished product is best stored in a brown glass container if the material is exposed to sunlight, or a clear glass container may be used while being stored in a dark location. Alternately amber glass or a ceramic container that does not allow any light through. Blue glass does not work as well as brown/amber glass. We usually filter the colloid after 72 hours then store it. The Colloid Master does not use or need a mechanical stirring mechanism. The Colloid Master employs a current bi-directional pattern to the electrodes which electronically changes the positive and negative positions periodically. The pulse induced by the polarity change, in effect, causes the silver particles to be electrokinetically stirred. The Colloid Master was the first device of this type to employ these features, which have been a standard feature since 1998. By design, we addressed this issue long before others even thought to consider it. We had noticed that when some users reported that they were using a fish tank bubbler to keep the water moving during the process, that then the solution was often colorless and transparent even after the 72 hour period. Although this is a rather complicated issue because the air itself now must be considered, as well as contaminants carbon, etc. must then be taken into account. The bottom line is this is the reason that dispersions made this way can become mostly ionic and true colloidal particles may be inhibited from being produced. If you choose to experiment with stirring, you are on your own. As mentioned in the literature, like a car that has a speedometer that goes to 120 MPH, most people do not drive 120 MPH just because the car can. A simpler idea is related to the Colloid Master; meaning that we suggest not driving it faster than 10-12 PPM. (For more info see below). This is a matter regarding the intended end use. However, we do not provide advice or consulting concerning individual applications or use of the silver dispersions. That said, based on our research, it has been our long-standing opinion that the optimal range for making a stable silver dispersion with water as the dispersion medium is 10 to 17 PPM. There are many factors that we took into consideration when making this decision, including the particle size as well as the overall colloidal integrity and stability. In our opinion, the silver dispersion is saturated with submicron silver particles in balance with the ionic content at approximately 13.5 PPM. So, the best range is 10 PPM to 13.5 PPM generally speaking. Although higher parts per million can be forced or attained via other processes, our research has convinced us that forcing higher PPM usually causes the particles to aggregate into larger particles, which in our opinion compromises the quality, integrity and in effect causes the colloidal dispersion to be less stable and desirable. We use setting 10 PPM to 12 PPM for most of our work. Colloidal silver can appear to be light yellow to yellow-brown like tea, not because of excessive oxidation as is sometimes reported. The main consideration is the surface plasmon absorption band polarization. The color is due to the light refraction of the yellow to yellow-red/brown part of the light spectrum. It is possible for contaminants or oxidation to be a factor regarding the color of colloidal silver, generally speaking, but the Colloid Master will not function if contaminants are present. The colors described above are a result of polarized charge contained in the surface plasmon absorption band, not contaminants or oxides. The reason is somewhat like explaining why the sky is blue. In this case, the colloidal liquid is light yellow to a dark golden color because silver particles absorb the blue part of the light spectrum while the yellow-red light spectrum is emitted as the golden color. Technically speaking, liquids other than water could still accurately describe colloidal silver, the addition of proteins may also still qualify as a colloid, even compounds may at times qualify, but when we speak of colloidal silver we mean 1 nm to 1-micron silver particles in water with no other additives. Colloidal particles are in a state of dynamic balance and are in essence electrically neutral (not positive or negative) because the two charges present about the cluster itself is in a state of equilibrium. It is the interplay of the particles and the medium that causes the particles to be in constant motion and evenly suspended and stable, which also describes the colloidal state itself. The thing to keep in mind is that colloidal silver is not just the silver in water that is the colloid, the medium itself (the water) is a part of the colloidal system. Colloidal Silver, Ionic Silver, and full spectrum, which kind do I want to make? This is an answer only you can provide and pertains to your particular needs and goals. The short answer is the Colloid Master was designed to make a full spectrum colloid and all colloids contain ions; it is a matter of ratios. Technically speaking, colloidal silver is defined as particles and clusters of silver one nanometer to one micron in size. A particle is considered at least two atoms of silver, each atom has at least 47 orbital electrons. Colloidal silver is particles-clusters that are approximately 1 nanometer to 1 micron in size, which are dispersed into a liquid. Technically speaking, liquids other than water could still accurately describe colloidal silver. The addition of proteins may also still qualify as a colloid; even compounds may at times qualify, but when we speak of colloidal silver we mean 1 nm to 1-micron silver particles in water specifically as the dispersion medium and no other additives. Colloidal particles, when they are in a liquid (dispersion medium), produce an interaction between the particle surface charge and ions within the liquid in the immediate area around the particle. Described as an electrical double layer, comprised of strongly bound ions closest to the particle (Stern) layer and the outer less strongly bound (diffuse) area. The diffuse area is also called the slipping plane, within which counter-ion charge accumulates as an ion cloud that moves with the particle within the dispersion medium. The electrical potential in the (slipping plane) notional boundary area is measured as an electrical value in volts (millivolts) and is known as zeta potential. 1 Micron = 1000 Nanometers. A unit of length equal to one millionth (10-6) of a meter. Ionic silver: Single silver atoms are about 0.288 nm in diameter. A silver atom normally has 47 orbital electrons; it is the loss of at least one orbital electron that is the description of the ionic state. Silver in the ionic state is considered dissolved, ions are not accurately described as particles and are not the same as the discrete state of particles as is found in clusters of atoms (at least two atoms each with at least 47 Orbital electrons) which is the definition of a colloid. The term colloidal dispersion is not an accurate description of a purely ionic silver because it is dissolved silver, which is accurately described as a silver solution or hydrosol. That said, there is virtually always a ratio of silver ions present with silver particles that are in a true colloidal state, even if it the amount of ions present in the dispersion medium is relatively small. The Colloid Master produces dispersions that are a combination of colloidal and ionic silver, the ratio varies from user to user and batch to batch, as a generalization somewhere in the range of 70% ions to neutrally charged nanoclusters has been usual. Results may vary. Using setting 10 PPM making a 32-ounce batch with a 1 1/4″ inch electrode spacing, using a 6 inch X 1/2″ or 1/4″ inch .999 electrode, and distilled water that is less than 1 ppm, then the average time to make a batch is approximately 3.5 to 6 hours. The water quality, environmental and variables such as amount of water used for the size of the batch, electrode size and electrode distance will vary with each user of the Colloid Master. Changes of these variables primarily affect the time a batch takes to complete. You will become familiar after making several batches, and with experience will familiarize yourself with the subtleties of the process. The time required to produce a batch at the same setting may vary slightly from one use to the next, even when using the same water, but the resulting colloid is predictable, small particle size is maintained and as a result, the colloid is stable. The PPM is very repeatable. We have colloid in storage from over ten years ago, which has remained virtually the same as when it was stored, meaning within 1 PPM of when it was originally made and stored. The Colloid Master shuts off automatically at the parts per million it was set for at the beginning of the process by sensing through the electrodes variables that correlate with previously known conditions that indicate the correct PPM has been reached, it then shuts off. It does not use a timer because changing variables that affect the process would not yield accurate PPM results if we used such a simple method. The Colloid Master automatic shut-off feature has been a standard feature since 1998. The Colloid Master will work with as little as about 12 ounces of water but the average batch size users most commonly make is a 32-ounce batch. The Colloid Master will work when making batches up to One gallon (128 ounces). 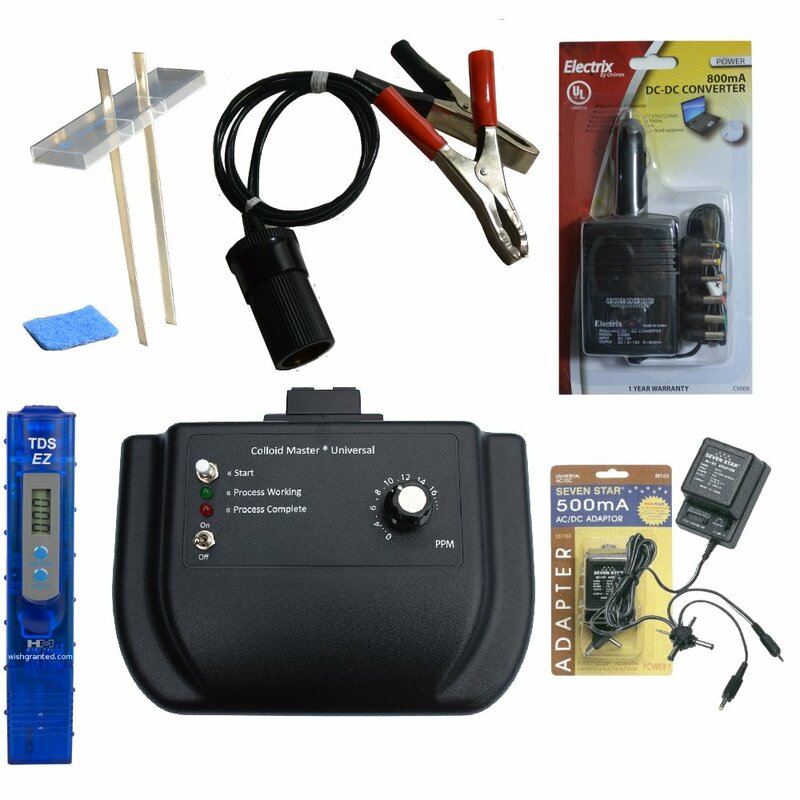 The Colloid Master will work with 1/4″ inch 1/2″ sized electrodes as well as odd sized electrodes. The Colloid Master will also work with custom electrode lengths and electrode spacing, if you are an experimental sort of person into customizing to your needs, then you will find that the Colloid Master is flexible in how it can be used while still providing consistent, repeatable results. The simple answer is brown glass or clear glass in a dark place. When the Colloid Master processing light shuts off the batch is done. At that point, the electrodes can be removed. The water (dispersion medium) combined with the silver particles will go through a dispersion-phase during the first 36-72 hours. During this time, the particles create stable associations forming nanoclusters. PETE type plastic stands for Polyethylene terephthalate. If you decide to use plastic containers, we can suggest that you look for a triangle type shape on the bottom of the container with the numbers 1, 2 or 4. These designations help establish types of PETE plastics that are likely to perform well for this particular use, also these designations help to avoid using plastics that pose toxicity and colloid degradation issues. To be clear, we only recommend glass, but, if for shipping or other reasons the use of plastic becomes necessary we do know that PETE plastic is friendly to the colloid silver state, we have stored CS in this type of plastic since 1999 and it is still with 1-2 PPM of what it was when it was stored. We have stored containers of the silver dispersion made with the Colloid Master in clear glass as well as clear PETE plastic bottles in a dark storage area at our facilities since 1999 with little or no change from the PPM that it was when originally stored. How the dispersion was created, the water quality, ionic content of the water, the container used and where it is stored in relation to environmental influences such as high-tension power lines, and moving magnetic fields, etc. must collectively be taken into account and have an overall effect on self-life. We have noted that very strong electromagnetic fields from things like moving magnetic motors if in proximity can have a detrimental impact on the stability of colloids. Regarding the Colloid Master stability, it functions the same way every time it is used, however; there are other factors to consider. Changes in environmental conditions affect the process within the dispersion medium (the water). Phenomena such as forms of cosmic energy directed at Earth from space, solar events, in particular, coronal mass ejections have fundamental dynamic effects that have a very direct concerning the colloidal production process itself. This is one of the main reasons that we do not use a timer for the Colloid Master, and instead use an electronic shut off per ppm feature. We have found that the are variable in the environment that change from batch to batch, so, to maintain small particles, a precise adaptive process is required, which lead to the creation of Colloid Master auto-shut off configuration. During the process there is water and silver interacting with electrical current, silver atoms and ions are dispersed into the water, some silver combines directly with oxygen (silver oxide) on the electrodes. The silver oxide that is produced during the process will not become suspended into the liquid because the material does not have the suitable properties to become truly colloidal. The silver oxide that accumulates on the electrodes aggregates into a much larger particle size, larger than one micron and precipitates and falls out of suspension to the bottom of the container. The finished colloid should be filtered just to remove the silver oxide material that falls to the bottom and is stirred up when pouring the liquid from the container it was made in, into another storage container. The colloid can be filtered and used or stored immediately after the process completes. Although you can use the finished batch immediately, it is usually best to wait for 36 to 72 hours as mentioned above, when the particles have finished dispersion and reached the stable phase. Solar events have a strong influence regarding slowing the process of making a colloid, primarily because it causes increased oxidation, which occurs especially when the sun is sending lots of high energy phenomena our way. The short answer is no; the Colloid Master will not work if any additives or contaminants are present in the distilled water. We do not use salt or bicarbonate of soda as a part of the colloidal silver production process. There are or have been proponents of the utilization of those materials, which is used to increase conductivity in the water, to compensate for the inadequacies of the overall control of the process and speed its completion. Taking the approach of adding salt or other materials can result in making a silver compound rather than a pure silver colloid, and can cause variations in the process that in our opinion are undesirable, such as producing too large of particle clusters, which makes the finished product unstable and undesirable. If one wishes to speed the process using the Colloid Master the only method that will work is the addition of 1 to 3 ounces of previously made colloid to the fresh distilled water before starting a new batch. This will decrease the time needed to complete the process. Using previously made colloid as a starter is the optimal method. The use of previously made colloid as a starter may take less time for the process to be complete but does not increase PPM or otherwise measurably alter the result. The typical temperature range for operating Colloid Master is: 60 to 105 F (15.5 – 40.5 Celsius). In the unlikely event, you have a dysfunctional unit, or just want to talk to a live person call customer support (423) 261-2492. If you have questions before buying feel free to give us a call. You can rest assured you will always have any problem or question addressed in a timely fashion.